Mesmerize the woman you earnestly admire by gifting her this Bounty-of-Blush Cheerfulness Assemblage and secure a cozy corner in her mind. 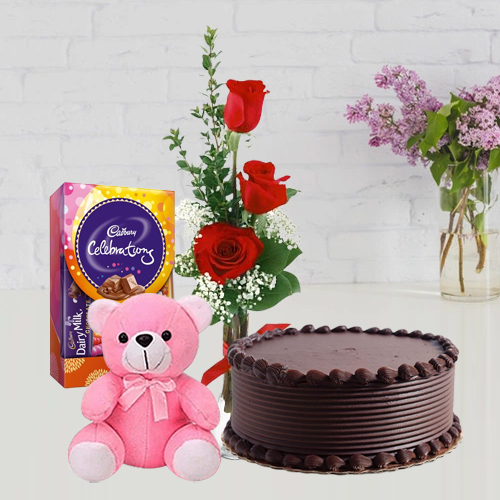 This Assemblage flaunts 3 charming Red Roses flocked together in a stunning pattern, a lovesome 6" Teddy Bear, a toothsome Cadbury Celebration Mini Box and a 1/2 Kg Eggless Chocolate Cake. Flowers Delivery Karur, Send sweets Kolkata, Wedding Cake Thiruvanthapuram, Diwali Mithai Jodhpur, Send Flowers and Gifts to Udumelpet, Online Shop Agartala, Flower to Tirumala, New Year Flowers Tanjavur , Fresh Fruits Tiruvananthapuram, Send Gift Hubli, Dry Fruits to Hyderabad, Birthday Delivery Karur, Sending to Bhilai, Flower shop Thanjavur, Pallakad Online Cake Delivery.